Be the first to share your favorite memory, photo or story of Estrella. This memorial page is dedicated for family, friends and future generations to celebrate the life of their loved one. 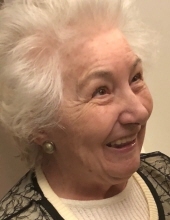 Estrella Couso, 79, of Perth Amboy, passed away on Tuesday, May 1, 2018 at the University of Maryland Hospital in Baltimore, Maryland. Born and raised in Monforte de Lemos, Spain. Estrella came to the United Stated in 1970 settling in Perth Amboy. She was member of Our Lady of Fatima Church. Predeceased by her husband Jose B. Couso in 2000, she is survived by her two sons; Jose L. Couso of Virginia and Miguel A. Couso of New Jersey; two daughters, Maria Estrella Velotta and Reyes Hourihan, both of Maryland; two daughters in law, Yon and Marisa; two sons in law, Vinny and Sean, and; seven grandchildren, Jennifer, Starla, Laura, Nicole, Sheila, Matthew and Emily. The family will receive friends on Monday from 2:00-4:00 PM and 6:00 to 8:00 PM at Zylka Funeral Home, 513 State Street, Perth Amboy. Funeral services will begin at 10:00 AM on Tuesday from the Funeral Home with an 11:30 AM entombment to follow at Resurrection Cemetery, Piscataway. Please disregard the link below to send flowers. It is the families desire that no flowers be sent, but rather contributions be made in Estrella's honor. To send flowers or a remembrance gift to the family of Estrella Couso, please visit our Tribute Store. "Email Address" would like to share the life celebration of Estrella Couso. Click on the "link" to go to share a favorite memory or leave a condolence message for the family.